Try steaming it out, can't hurt. ...but mostly you don't have to, and some styles can't be built directly into the top, for example, this "Australiana" style. Mostly, I build rosettes on backing boards, then cut them from the board as a unit with all of the leveling and thicknessing of the rosette done. They are then dropped into the soundboard just below level and the soundboard brought down to flush. Thicknessing of the soundboard is then done from the back. 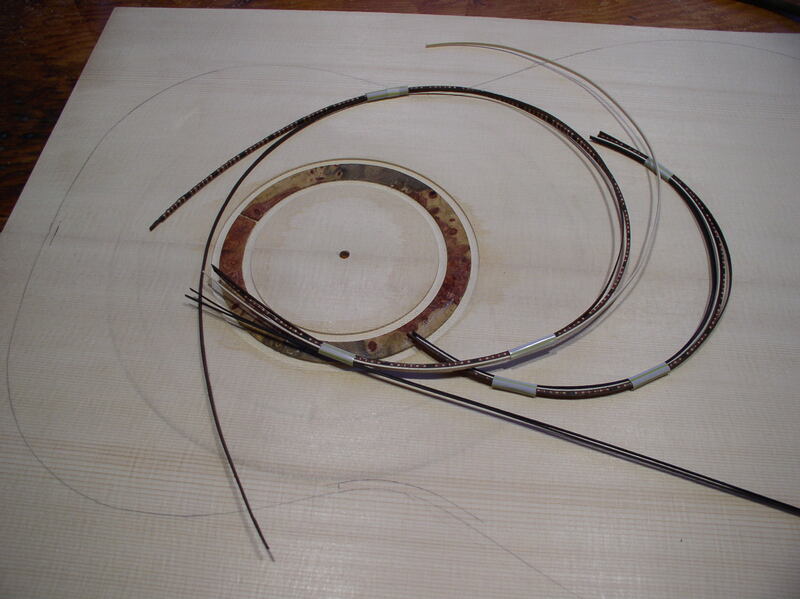 You have the advantage of knowing exactly how thick a rosette needs to before you put it in the soundboard and the additional advantage of being able to make 3 or 4 rosettes at the same time, meaning you get 3 or 4 uses of each router diameter set-up. Below 3 different styles, each made 3 at a time on backing boards. Wow Trevor! I really love that "deco" rosette. I'm not normally one to be heavily influenced by the visual choices made in a guitar, but I'd buy one with that rosette in a heartbeat. If its just one tile torn out can't you repair that segment ? If the rosette detail is endgrain - it needs the sharpest and finest set tools - or play safe and scrape the last marks out ! Trevor: beautiful work! I had thought to do the next one outside the top. How are you removing the rosette from the wood? Geoff, I think this one's a goner. To replace the torn segment I'd have to rout the channel deeper than it is, then I'd break through the back, for sure. Unless I glue on the soundhole reinforcing patch first? I sort of want to do the rosette over from scratch anyway. I think you should try to save the top, it is definitely doable. I recommend you make the new rosette on a separate board, as Trevor mentioned. Once you have the new rosette, then you rout out the old rosette. The new rosette must be the tiniest bit wider than the old one (internal diameter smaller and external diameter larger). You rout out the channel to de actual dimensions of the new rosette, creeping up to the final size to ensure a tight fit. But the new channel does not necessarily have to be deeper than your old rosette, the exact same depth will do as long as you remove all of the old rosette. You can glue on a reinforcement patch on the inner face for added safety and still plane to final thickness on the inner face as well. Remember you only have to thickness the lower bout (from the LHB down). The rest can be left untouched at its current thickness. Nothing worse than a perfectly purfled guitar with an ornate rosette and nothing remarkable about the sound. Thanks Steven. The area around the blow out is only 2.5mm think. Rest of the top is 3- 3.5mm. seems I'd have to take the whole plate to 2.5, then route out a new channel barely 1mm deep. The channel originally went pretty deep and I can see the outline of it from there back side. Unless I glue the reinforcing patch on first, which send possible. I'll certainly give it a shot. I don't see being able to repair just the low spot. At 2.5 mm you have enough material to work with. Get the outside surface of the soundboard finished and apply some protective clear shellac. A 1 mm depth to the rosette is shallow but OK providing you don't have to take off any more from that outside surface. If you use a doughnut type reinforcement that is wider than the outer circumference of your rosette it will be fine. At some point you have to learn from these kind of mistakes but more importantly learn to fix them as though they never happened. This is one of the easier type to recover fully from. I have excavated the rosette and surfaced the soundboard to a uniform 2.5. I have a 1mm deep trench and will attempt another rosette! One question: when gluing in plain veneer strips, it's unclear to me if people are gluing those strips together, or only bedding them into glue in the channel? I had a sort of "glue trough" with slightly watered down titebond II that I was swabbing my strips through, ganging together in my hands, then pressing/pushing/squeezing the entire thing into the trench. It was a major mess and nervewracking, but it worked. All of it was pressed all the way down to the spruce. I'll look out for your order, Chris! You know where I am! The backer starts out ~2.5mm thick and the tiles or whatever are about 2.2mm thick. The tiles get inlaid to about 2mm and are leveled, then the rings are added and leveled and then any grain filling can happen and that be leveled. The whole thing is about 2.2mm thick after all of that and I leave it at that until I want to use it. When I want to install it, I thin it from the back whilst still square until I can just see the underside of the rosette through the backer (so the backer is still continuous but very thin). Then I just rout around the outside and inside to free the rosette. When you have the rosette free and know its exact size you can cut its channel in the soundboard. You bed them into glue that is in the channel. Putting glue on them first is going to turn it into a bit of a nightmare. It's good practice to make each and every strip the same height and clamp them all down. I know some makers get the rosette flush, seal with shellac and then flood with CA. Presumably it wicks into any tiny gaps and helps fill the inevitable little 'pores' that you get around the rosette. To be safe, I don't pre-laminate lines any wider than about 2mm. Thicker and they bind and bunch up when bent into a circle. If I am using typical vener, (.6mm) that means 3 lines can be bent after gluing. The exact method of gluing sort of depends on your situation. For gluing lines while bending... You can make a couple round pieces (inside and outside diameters of the rosette) to glue lines together around. I'm not sure if this is clear enough, so here is something in process, with some preglued/prebent and some lines free. Note that pieces of sippy straw hold together groups of lines prior to gluing in. Here is sort of a step by step, picture by picture of one rosette inlay. Many other methods and variations are practical. Thanks for sharing your work. I too have the Bogdonavich book but I have not yet taken any steps toward building a guitar yet.